I’m just wrapping up my third cover design branding workshop co-taught with Dean Wesley Smith, this time for science fiction covers (and working on a new promotion concept—but more on later in a bit). Sci-fi covers are simultaneously simple and complicated. The simplicity comes in the art and typography choices (although I can hear the workshop participants yelling now that this stuff is anything but simple <grin>). As a designer, sci-fi calls for a distinct look, which makes it more formulaic (and thus simple for a designer) in the choices of art and fonts. Sci-fi art and typography looks futuristic for the most part. The art is fairly easy to search for, usually. And there are multiple great options for typography. The complexity, for me, comes in making the covers look individualistic enough that the books stand out in the field even as they clearly represent their genre. That was my biggest concern when I agreed to do a sci-fi cover workshop. Could I, the same designer, generate enough disparity in covers when doing them in bulk as I do for these workshops. The following composite shows the cover templates I created for the authors in this workshop. Some of them are pretty raw because I was having to cobble together art quickly (the final versions would be much cleaner). 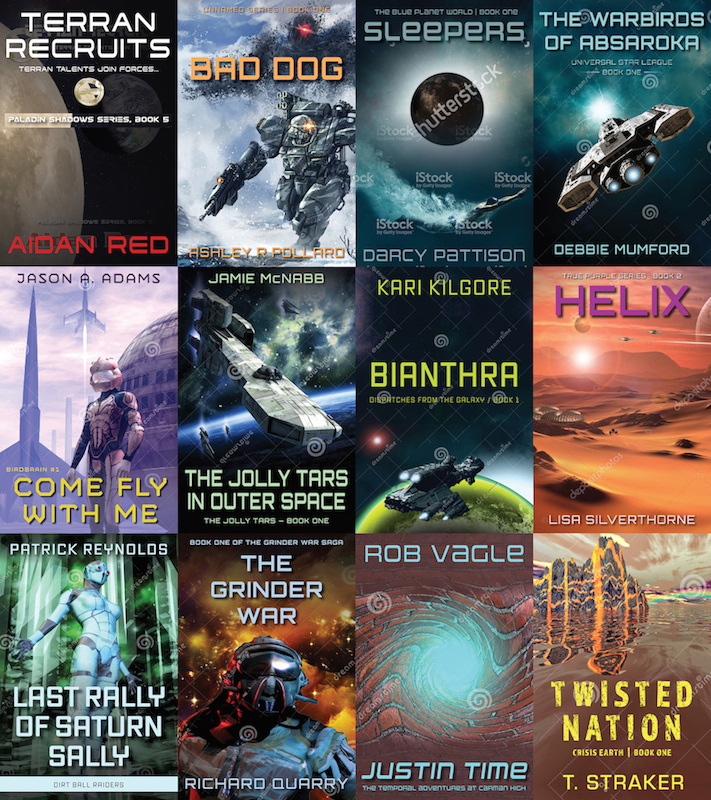 But they’re a good representation of the possibilities in sf cover design. There are a couple of YA books in here as well as a post-apocalyptic offering (bonus points if you can tell which ones those are). Designing these covers is fun, but my time is limited, so we probably won’t be able to offer one of these again for a while. However, if you want to get in on the newest offering from WMG, you’ll need to act fast. It’s a Promotion and Sales Package that includes a cover and a whole lot of promotional materials for a complete sales package for one of your books. You can read more about it here, but don’t delay because the offer ends Dec. 18.